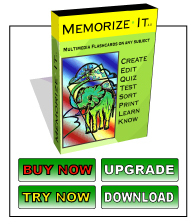 For the past few years I've been working on a new version of Memorize-It. Before you decide to hold off on your purchase I have given a FREE upgrade to anyone that has purchased in the 6 months previous to every release. Also, upgrades are always only $10. One of my biggest disappointments with the software industry is the cost of maintenance and yearly updates. It really gets my blood boiling: the yearly cost, the upgrades that are nearly the same price as the original and the crazy schemes that companies come up with the take advantage of you. I never started this venture to make a ton of money. I have a regular job and did this on the side for my own benefit and decided to release it as a product after a few years of refinement. Mostly just to share what I've done with others. Anyway, here is a screenshot of the latest quiz win. I still have a lot more work to go, but it has been a consistent bit of progress forward for the past six months. Probably a lot longer to go, but I'm excited to finally get this done and have been putting much of my extra time on getting there.